Why Tornado Alarms Make Me Freak Out a Little Inside. Yesterday, we had all sorts of tornado warnings here in Louisville and the surrounding areas. Most of my co-workers took the tornado warnings very lightly. I, on the other hand, was trying to get as much information as possible about possible tornadoes. I used to take tornado warnings very lightly, until February 5, 2008. 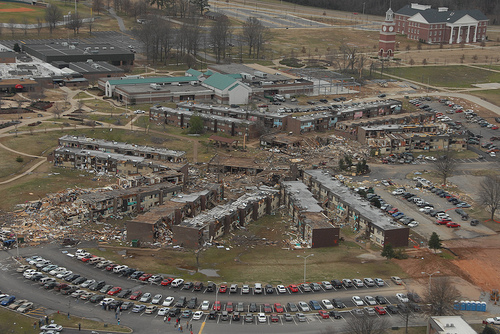 On that day, my university – Union University – was struck by an EF-4 tornado. This picture is of what used to be a girls’ dorm. I talked on Monday about life-changing, paradigm-altering events. February 5th was one such event in my life. I used to lock my dorm door and go to sleep if I knew there might be a tornado warning, so I would not be bothered by it. Now, I am made vigilant by any tornado warning. The tornado at Union was like nothing I could have imagined. The damage was shocking. The night of the tornado was terrifying. I was stuck a mile from campus hearing all sorts of third-hand reports about collapsed buildings and dead students, and the forecasters were predicting another tornado on the heels of the first. Thankfully, no one was killed, although a few of my friends were pretty banged up. Many people I knew – including my now sister-in-law – lost everything they had. The tornado scared the living daylights out of us, but it also united us and made us stronger. We worked together, and by God’s grace, we were able to endure it. I was immensely proud of the way my university handled this tragedy. Many of my friends were interviewed on CNN, MSNBC, and Fox News. They exhibited such a strong faith in the Lord despite the storm that some reporters accused the staff of coaching the students, but there was no coaching. We all knew that it was only by the grace of God that we were all alive, and we wanted to tell everyone about it. Since the tornado, Union has done exceedingly well. They have built new dorms to replace those destroyed. The new dorms are incredible, in fact, I am a little jealous over them. Union has been consistently ranked in the top tier of universities in the South by Us News and World Report. Union has rebuilt bigger and better. They have new swanky dorms, a new coffee shop – with a sweet La Marzocco Espresso Machine, and a new pharmacy school. I am proud of Union University. And now you know why tornado alarms will make me freak out a little inside for the rest of my life. I hope all is well with you, and I hope no severe weather is headed your way. This is great! Not the fact of what you went through, but the testimony that evidently came from it. Often times we have this false sense of security that because we feel we’re right with God or that because we’re at a theological institution the storm will just pass right over and not hit us. Sometimes however, God may bring the storm that He might be more glorified as you showed with Union in this post. Thanks for this.